A week at home with the throat had only one silver lining for me: I was able to finish four books, making my total books read in 2013: 13! Usually it's hard for me to concentrate on reading when I'm sick, but, though there was the painful swallowing, and lack of sleep, I didn't feel exhausted. I didn't even lose my appetite, which is both a shame and a good thing. So I snacked, drank loads of tea and gulped down book after book. It was, as usual, difficult to pick a favorite. I'm going to go with the one that fed into an early-year obsession for me: Lady Almina and the Real Downton Abbey: The Lost Legacy of Highclere Castle by the Countess of Carnarvon. Characters come and go on Downton Abbey, but the backdrop, that big museum of a home, keeps standing. Of course, it's not just the setting of the wildly popular drama, but the inspiration for some of the storylines. There's big differences as well, though only those who have seen the second season of Downton might know what I'm talking about. Lady Almina, wife of the 5th Earl of Carnarvon (the one behind the discovery of King Tutankhamun's tomb), was the driving force behind the conversion of Highclere into a hospital for WWI soldiers. That, to me, was her selling point. Otherwise, the money she brought into the family certainly helped, but that's just par for the course in that time period. This was a quick read for me, mostly because I was already familiar with the time period. Still, it helped to pull the fiction and the reality together for me. Descriptions of the lifestyle and work of the staff was probably my favorite section of the book. The only thing I would have added was more of what happened to Lady Almina after the Earl died, as well as how the rest of the family fared afterwards. But I'd say if you like the show and you also like to read, then read this one. First, an herbal: Raspberry Leaf Infusion: Why? It supposedly aids in pregnancy, though I doubt it'd have helped Lady Sybil. Next, Irish Breakfast Tea: The Branson storyline (we can call him Branson again, thanks Dowager) was an important one for the past two seasons, and now even more so since he's a widower with new responsibilities. In line with this, the tea must be sipped in good china, reflecting the juxtaposition of his life as former staff turned Family. 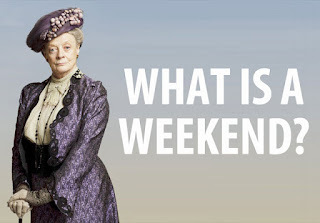 I am eagerly awaiting DVDs of Downton's third season--so hard not to get spoilers!